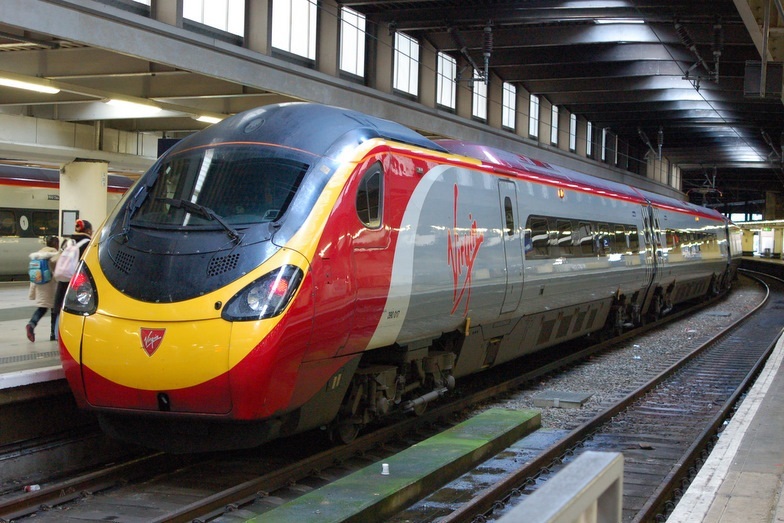 In the three plus years I have been commuting from Lancaster, to Preston and back to Lancaster on the days that I have been into University (as well as the days that I have not needed to be in at University) I have had some interesting moments on the train. 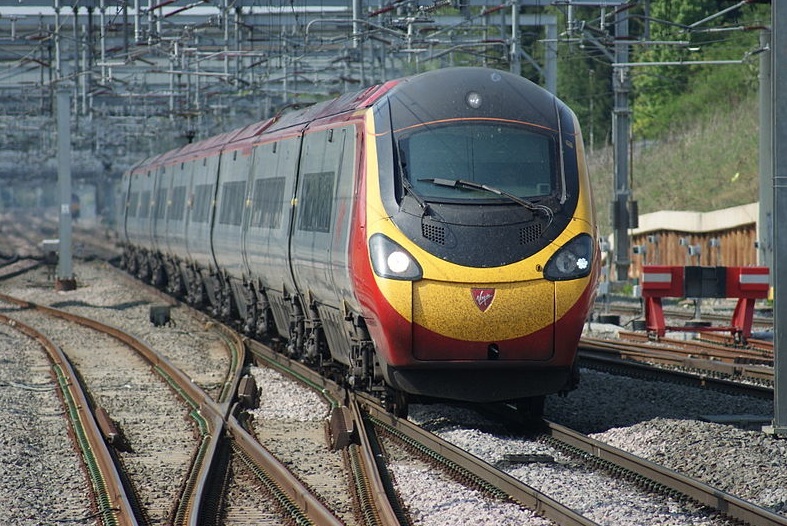 One time in in foundation year, I accidently boarded a train which did not stop at Lancaster train station, having to wait until I got to Oxenholme Lake District to change trains to one that was going back to Lancaster. Other times have included staying on trains that were heavily delayed and not moving, trains that were without managers or more worryingly; without drivers, trains that were going north but to the wrong destination and changing trains due to delayed trains which then begin moving without the station announcing that the train was no longer delayed; one time last week, I was on a delayed train, thinking I would stay where I am while the train waited for the train manager to arrive but decided not to inform the other passengers that other trains were available. All these though somehow don’t compare to a few weeks ago when I was boarding the train from Preston to Lancaster and the door digital Display read, “Hey There Gorgeous” on the bottom line. I was at Preston station waiting for the train home; I have now cottoned on to the train time system for trains heading in my direction. It is pretty much pointless going to Preston train station for anytime on the hour or just after as most trains heading in my direction (four, six or seven at best, but a rare occurrence) don’t really arrive into Preston train station until about 20 to the hour (or 40 minutes past the hour), but then the first one is a train that by chance stops at Preston, but then goes to Glasgow Central Only, so any wonder why it stops at Preston in the intermediate time. Anyway I was waiting for the train, and a Pendolino heading for Lancaster was arriving at the train station. I checked the station board to see if it was heading for Lancaster, I then double checked the door digital display. While I was doing that I spotted a slogan that I looked back at to re-read, and it said “Hey There Gorgeous”. I have not once been greeted or complimented by an actual train, so this was definitely a first. Unfortunately at the time I didn’t have my camera, so I did not take a photo of the train door, however it did actually say that. The bottom of the door display is usually blank; it doesn’t really say anything at all. On this occasion however, it actually had a phrase on it, one that was like a greeting. I have no idea how this happened or why it actually said that but I thought I would share my experience, because, well, it is kind of weird. Back in July/August when I was on work experience in Manchester, I was looking through twitter and discovered that The Escapist had a new show on their website. The show is hosted by the combined efforts of Jim Sterling who presents the Jimquisition, and Ben “Yahtzee” Croshaw who presents the internet phenomenon; Zero Punctuation, to which both shows are shown on The Escapist. Jim and Yahtzee, both being originally from Great Britain previously co-hosted a show on the Escapist called Jim & Yahtzee’s Rhymedown Spectacular where they would each present a poem on a similar theme each week. The show went on for about a year, and was quite entertaining in the process; both showing their talent for poetry as well as write and perform poems about Video Game subjects. Since the poetry however, Jim and Yahtzee have now changed direction and have started, once again co-hosting a new series on Video Games; Uncivil War. Basically each week, the two presenters play the same game, and make up a challenge which does not really exist in the game whilst also providing an awesome sounding name for the challenge and see who is better at it. For instance, in one show they played the new Watch Dogs game where the challenge was to run over as many in game characters who wearing the same colour clothing as the car that the co-host was driving and so therefore named “The Car-Clothing Colour Co-Ordinated Carnage Contest“. On a later episode, the challenge was a lot simpler as they played Left 4 Dead and challenged themselves in trying to be the first person to board the helicopter at the end of the ‘No Mercy’ campaign, suitably named the “Get To Da Choppa” challenge. The show is very well produced as the title card and intro for the show publicize itself as being like an old-fashioned boxing match with even a pumped up introduction in the opening sequence while simultaneously assigning a blue and red corner to each participant. The title card at the beginning of the show as well as on the video view slide also gives the impression of a fly poster on a brick wall somewhere promoting the fight. The show also has a brilliant opening theme produced by another Escapist; Gavin Dunne who creates the Miracle of Sound songs and videos (including the brilliant song; Gordon Freeman Saved My Life). The theme tune is actually really catchy and while short can be expanded for little points in the show’s soundtrack. The opening theme though begins on a strong point with the lyric “Get Ready For War” before continuing with the rest of the sequence and keeping the song going. Uncivil War is a terrific Show. I like it for the part of the shows co-hosts as well as the theme and soundtrack; but what I like most about it is that it represents for me anyway of what multiplayer games should be. Not just a straight race, or death match, or anything along those lines. Games should have more daft, silly modes for the basis of multiplayer more often, and the show’s two brilliant presenters have shown that. These are the kind of little games I would like to play in multiplayer more often, a little challenge between players to spice up the multiplayer element that little bit more. I remember watching my brother and a friend play one of the original Need for Speed games and not race each other, instead they spent their time tipping over big trucks with their cars. It’s little games like that between players as to what multiplayer games should be about, having fun doing something a little bit silly every now and again as well. 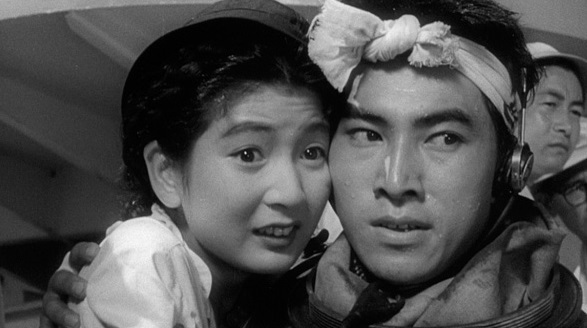 60 years ago, a Japanese film producer created his own Movie Monster. The idea came as the national occupation of the American Military after World War 2 ended and there were no longer any limitations on what filmmakers could produce. The country, still reeling from the devastation that had been brought upon their country in the form of the only two nuclear bombs to be dropped on a civilian population, were still paranoid to the side effects of radiation, nine years after the explosion, not to mention the incident involving the fishing vessel Daigo Fukuryū Maru (Lucky Dragon 5) and the national scare that followed. Gaining influence from this the producer created a creature which was not like anything seen before, as this creature was both powered and enraged by the destructive capabilities of the nuclear age. The creature and the film it appeared in were called Gojira, later Americanised to Godzilla. 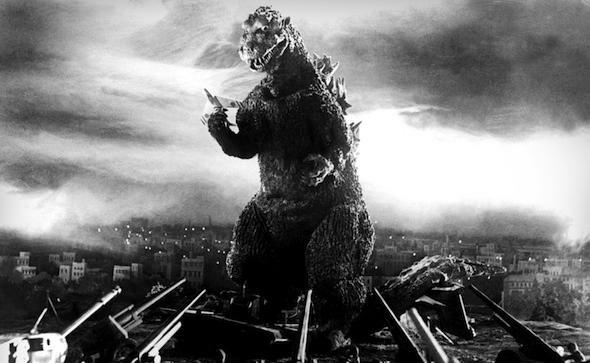 60 years and more than 25 sequels later, the creature known the world over simply as Godzilla is still as iconic, inspiring and influential as his first appearance back in 1954 and to this day is loved by millions of fans all over the world, including me. 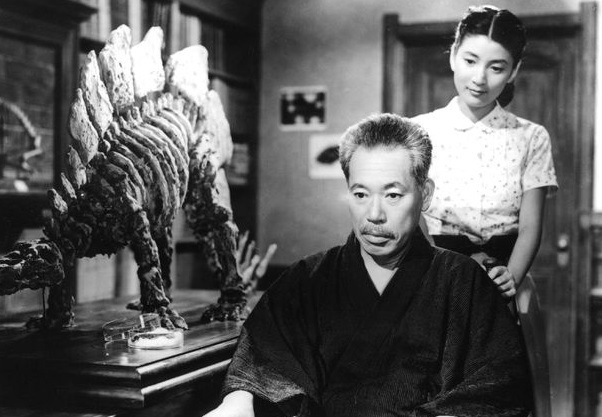 60 Years on and the original Godzilla film is still regarded as a true classic of Cinema. Released in 1954 by Japanese Movie Studio Toho and Produced by Tomoyuki Tanaka and Directed by Ishirō Honda with Special Effects by Eiji Tsuburaya and a soundtrack composed by Akira Ifukube, Godzilla (also known as Gojira) is the film that introduced the gigantic, fire breathing, nuclear mutant reptile type dinosaur to the world. 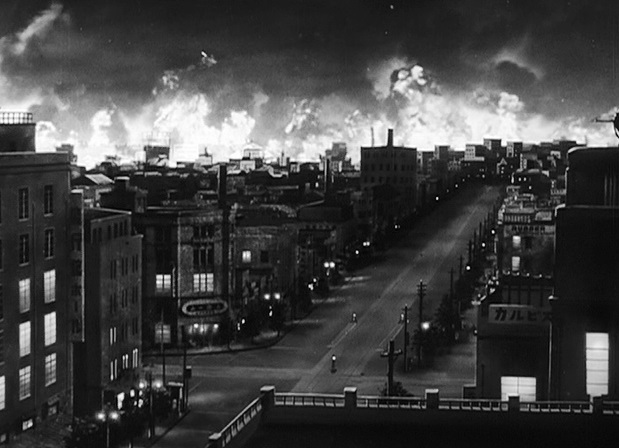 Godzilla himself is all of those things said beforehand but also a statement of the destructive power of the atomic age and the repercussions brought on by nuclear weapons. With the initial idea coming from the mind of Producer Tomoyuki Tanaka and a story from Director Ishirō Honda and writers Shigeru Kayama and Takeo Murata, the story involved the Discovery of such a creature, and then it’s arrival on the Japanese Mainland. The film begins with a fishing vessel out at sea, where the onboard fishermen notice a white-hot flash before the ship explodes. The incident is reported another vessel is sent to investigate, but is met with the same fate. Three survivors are picked up by another vessel where a survivor mentions seeing a monster. That ship is then lost too. On Odo Island, an old fisherman (Kuninori Kôdô) and a young man called Shinkichi (Toyoaki Suzuki) spot a raft coming into the bay. 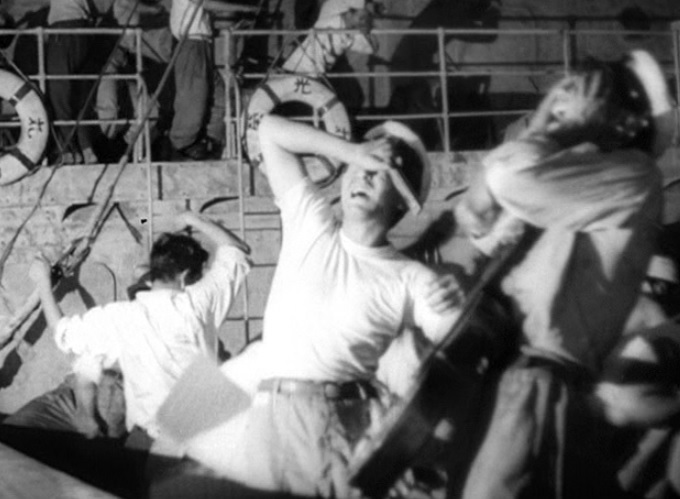 On the raft, a man called Masaji (Ren Yamamoto) is rescued. The following morning on the island, the fishermen were unsuccessful in their haul and the old fisherman says it is because of Godzilla. Everyone dismisses it as a legend but he says it is still true. A reporter called Hagiwara (Sachio Sakai) comes to the island to investigate, but when he asks Masaji, he has trouble believing his story of a monster. That night the villagers hold an ancient ceremony to try and soothe Godzilla’s anger. Later that night, a storm comes to the island. As they sleep, Shinkichi hears a crashing sound, runs out of the house but as Masaji tries to follow on he sees something that terrifies him and the house is brought down on him and his mother. Survivors of the disaster say what they saw trying to say that it was not the storm that caused the destruction and that it was a monster which did it. 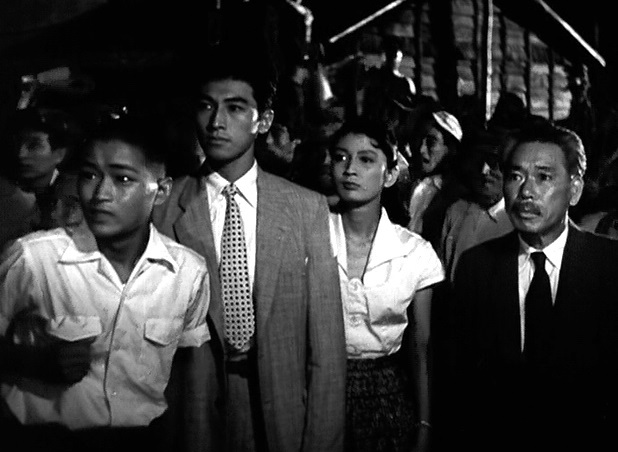 Palaeontologist Dr. Kyohei Yamane (Takashi Shimura) suggests that an investigation on the island should be conducted. 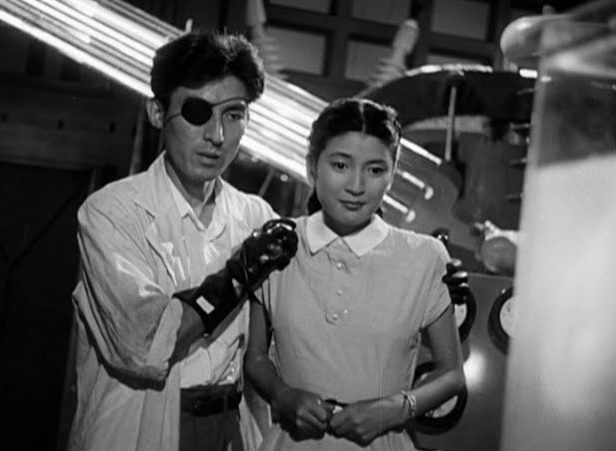 Along with him are his daughter Emiko (Momoko Kōchi) and her boyfriend, salvage ship captain Hideto Ogata (Akira Takarada) along with several other members of authority and scientists including colleague Dr. Tanabe (Fuyuki Murakami). When they reach the island they discover that some of the village wells water are radioactive, but not all of them. 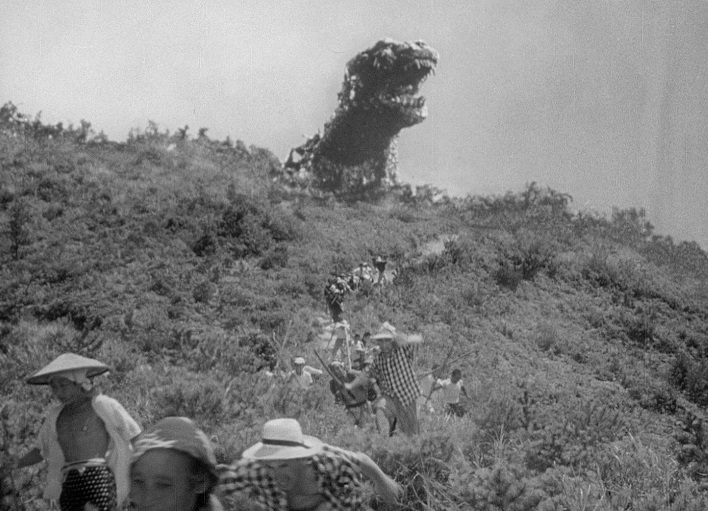 The village alarm bell is rang and loud beats are heard as the villagers shout Godzilla. As they race to the top of the hill to see what it is, a giant dinosaur like head appears over the fill with dragon like spines running down its back. The villagers try to run with Emiko in harm’s way, before Ogata rescues her. The creature then disappears as the villagers spot its tracks in the sand below. Dr. Yamane returns to Tokyo to report his findings. He says that the creature they saw was in fact a dinosaur which has survived in the ocean depths for about two million years before being awoken by recent H-Bomb testing in the pacific. He gives evidence to his theories showing a trilobite which was found in the creature’s foot print and that the sand found on the trilobite was radiated with Strontium 90. At the inquiry, people are undecided if they evidence should be made public, with some saying yes because it’s true, and others saying no, because it will harm international relations. In the end it is made public, and Dr. Yamane is asked to help find a way to kill the creature, but he wants the creature to be kept alive and studied. Ogata and Emiko talk about wanting to get married instead of Emiko marrying her current fiancé. Hagiwara asks Emiko is she can get an interview with her fiancé, and she says yes, just so she can talk to him herself. 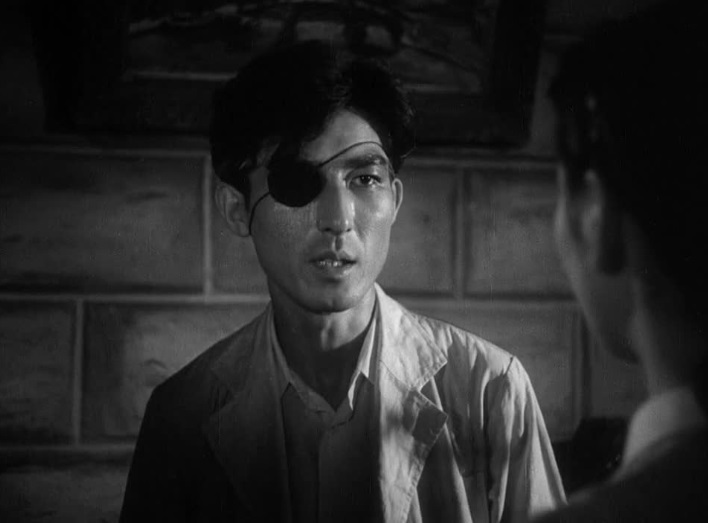 Hagiwara talks to the man, a young scientist with an eye patch over one eye called Dr. Daisuke Serizawa (Akihiko Hirata). He is however very secret about his work and when asked about Godzilla he tries to avoid the question. Hagiwara leaves and Serizawa shows Emiko his work, trusting that she won’t tell anyone about it. They go into his laboratory and look at a fish tank. Something happens inside it which horrifies Emiko. That night, Godzilla arrives and attacks Tokyo. The attack is very brief but he destroys a railway under is weight with ease. The next day the military set up a defensive line with a giant electric fence in the form of electrical pylons charged up to 50,000 volts. At home Emiko and Ogata still struggle to tell Emiko’s dad about their relationship. Godzilla attacks once again and breaks through the electric barricade with ease by melting the pylons with his atomic breath. The defense line is no match for the invading monster as tanks and guns don’t seem to have any effect on him. Godzilla then goes on a rampage setting fire to buildings and toppling others with sheer strength. The military and emergency services are told to try and control the fire, but it seems that nothing can be done for the might of the monster. Godzilla continues his attack with absolutely nothing able to stop him destroying everything in his path. Godzilla eventually leaves the bay unscathed despite an attempt to kill him by the Japanese air force. The next day Tokyo is in ruins. While at a shelter with some of the survivors, Emiko breaks her promise and tells Ogata what happened at Serizawa’s lab. Serizawa has discovered a lethal energy within oxygen with it and created his own weapon which he calls the Oxygen Destroyer. His demonstration of the device is what scared Emiko as it killed the fish in the tank. Convinced that the device can be used to kill Godzilla, Ogata and Emiko go to see Serizawa, who tries to hide and get rid of the evidence. He says that he didn’t want to discover the energy and that if it was used once, it will be used again and again, just like nuclear weapons and that if it does get used he will kill himself to prevent it being used again. A song is then broadcast across the nation, a song of a group of school girls praying for hope. Serizawa sees this and agrees to use the weapon on Godzilla, but only once and burns his notes. A fleet of ships travel into Tokyo bay and locate Godzilla underwater. Serizawa says that he needs to go underwater to use the device despite not being a diver. Ogata lets him providing that he goes with him. When they get underwater they spot Godzilla. Ogata heads back to the surface while Serizawa activates the device. The device begins to choke Godzilla who dies within a couple of minutes of the device’s activation. Serizawa tells Emiko and Ogata to be happy before he disconnects his breathing apparatus, killing himself. Dr. Yamane reflects on the possibility of another Godzilla appearing one day if the world keeps on using nuclear weapons, while Emiko breaks down at the knowledge of Serizawa’s death. The navy salutes the courage and death of Serizawa. Godzilla is a tale of many stories but for the most part on the human side it is a story of four people and their relation to what is happening in the moment. Ogata’s personality, while still being young is very mature and while what is going on is frightening, he is able to keep a level head in the moment. His love and care for Emiko is well noted and it is only in that respect really that he is an action man, saving her from Godzilla for instance. He also takes the moral high ground given what he finds out about Serizawa and doesn’t want the oxygen destroyer for himself, but to use it against the monster, and even when facing odds against Emiko’s father, he still takes the high ground for civilization. Ogata’s character is a bizarre mix as he appears to be a character without flaws, but despite this though his role is rather enjoyable. Dr. Yamane however is the science character of the film. Many of these monster films usually require such a character to explain the monsters existence. For a character though, he makes science both look morally flawed and a little bit selfish. While understandable that a man of science wants to study such an amazing creature, his total lack of understanding and acknowledgement the damage such a creature can cause is noticeable and even when he comes into confrontation with Ogata he will not budge. 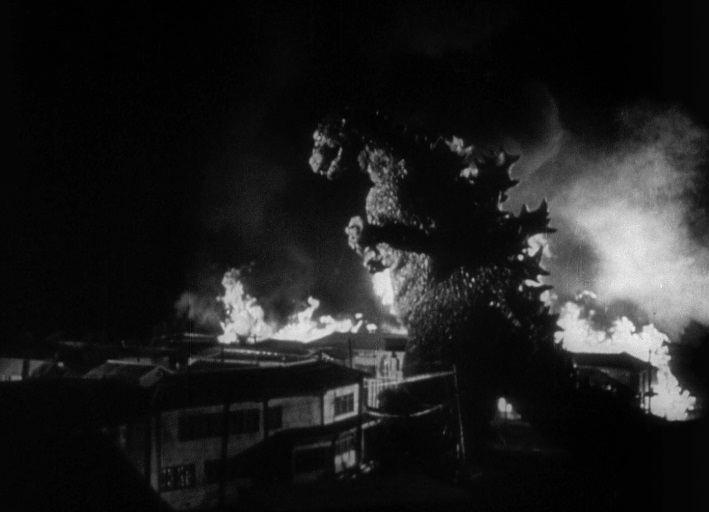 While he does have a level of sympathy on part with the audience in his earlier moments, such as his explanation on the existence of Godzilla and his time on the island as an excited scientist, his spiral into a basic state of sadness and desperation at the desire for Godzilla to remain alive, puts him more on the side of an antagonist in the midway to later parts in the film. While a level of sorrow is displayed on his part, to the point of view of the audience he no longer has that energy like he did in the early stages and you almost fall out with him, and even when the end comes his almost selfish want for a Godzilla remains present and his own sorrow is probably only partial for that of the death of his friend, and more for the death of the monster. Emiko plays the part of the film’s narrator as almost all key film moments revolve and include her in some manner of form, and is introduced very early on for this point. Her part of the fiancé to a man she doesn’t really want to marry, her caring relationship with for her father and the relationship she wants with Ogata. It’s her friendship to Serizawa though that her character becomes strongest in the film. 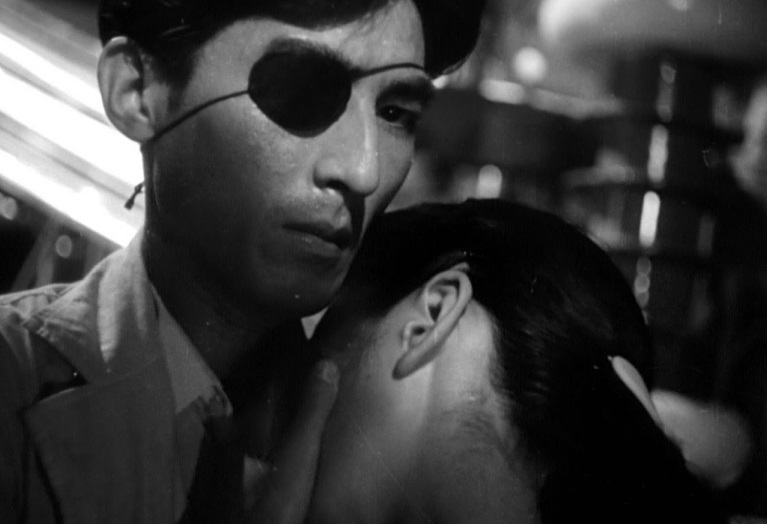 His trust for her, the horror she sees in the fish tank, the need to keep it quiet but the burden of its knowledge, the devastation to herself of revealing the secret and by this she knows that she has killed him, knowing he will commit suicide and it is only from his death that she can be with Ogata, and the blessing Serizawa gives for both of them at the end almost ruins her. She is the emotional anchor for the film and the character that connects the audience to the events on-screen, her look of questioning when she finds out about the sinking at the beginning and the questions that grow from that. It’s a natural reaction, one which the audience need in order for them to be brought in and get involved in the film’s earliest moments. Whilst her character is mostly played on the part of expression than speaking, she is enjoyable from start to finish and is one of the film’s main outstanding (human) points. The character of Serizawa though is different to the others as he himself, much like Godzilla has a major point and story to him, one of excitement and regret. His desire to study oxygen leads him to a terrible discovery, but as a scientist he can’t but help take a look and it’s only from this actual doing motion that he comes to regret his actions. It is from this point that he becomes secretive, so that no one can do the same thing again and make sure no one knows about his discovery. But it is in turn the human need for accompaniment and need for personal help that he tells the only person he can trust. Thus he reveals his actions to Emiko and through this shows his great regret. He is in many a sense a true scientist as he thinks more about discovery to help mankind and not destroy, but knowing himself the actions of what war and destruction brings due to the loss of his eye, he knows that if a piece of science has potential to be a weapon and is revealed it will be used again and again. It does become obvious in a sense that he does kill himself, mainly because he says he will, but also because he is a damaged man and can’t see any way to end his personal pain; but due to how likeable a character he is, you don’t want him to and there is a real emotional attachment to him taking his own life and you do feel that sorrow. On top of that, Serizawa also adds a little twist to the film’s plot. The film is one of very few films that works in tandem with its trailer. Serizawa shows Emiko his invention, but initially the audience does not see it, and the trailer teases this point also, but you wonder if his scientific study and discovery are him actually creating Godzilla. Its like; he’s Dr. Frankenstein creating his own Monster, but by accident or not, we don’t currently know. It’s only until Emiko reveals to Ogata what Serizawa showed her that everything clears up, but for a moment you wonder. You question if Godzilla is this mutated dinosaur at all, or if he was actually created in a lab. But it’s only really the case when you look deeply into this possible plot twist, that you think about it; something that the film and trailer do well together. It’s from the portrayal of Serizawa by Akihiko Hirata and how well the film is put together that achieves this effect, and it’s an effect well done. While these four are the film’s main human characters, they are not alone in this area; however some of these don’t have much of a presence. 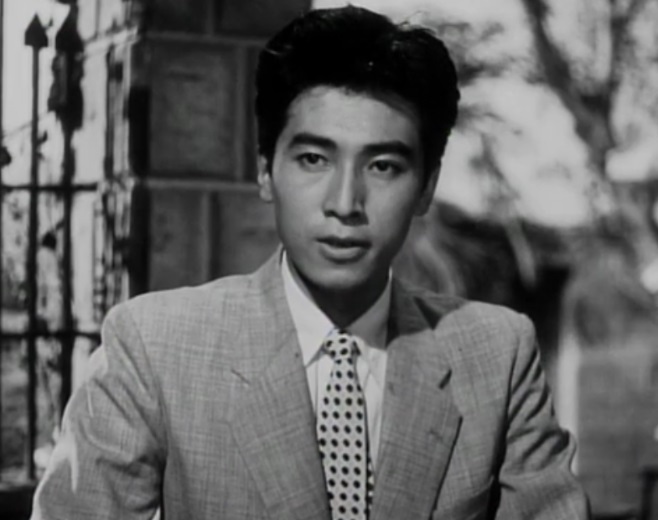 The character of Hagiwara for example is a brilliant journalist as he is both sceptical and pushy, but as for a part, not much else is really shown about him for him to be a character of great interest, but when he is on-screen he is played rather well. The role of Shinkichi though doesn’t have much weight as he is more of a friend to Ogata and while he does show a lot of sorrow to the death of his brother and mother, a scene which is a definite highlight in the early stages of the film and does show a lot of depth, for the rest of the film, his part seems to have forgotten about this and does not carry the weight of it and for the rest of the film he is more like a whisper than a key player; the part of his brother Masaji however is terrific. He gets very little air time but it’s the moment on the island when he runs out after his brother and sees something terrifying. The shock and terror registered on his face makes a connection with the audience as to state that there is something else going on, and that this is no ordinary storm. It’s this use of the power of suggestion that grips the audience. Other characters of note include the woman on the train who also appears on the pleasure vessel, the woman and the man arguing at the science debate as to what to do about Godzilla, as well as the session chair. The fishing girl dismissing Godzilla as just a legend and the homeless mother and her kids coming to terms with the situation. But to me, the best out of all these other characters is the village elder played by Kuninori Kôdô. 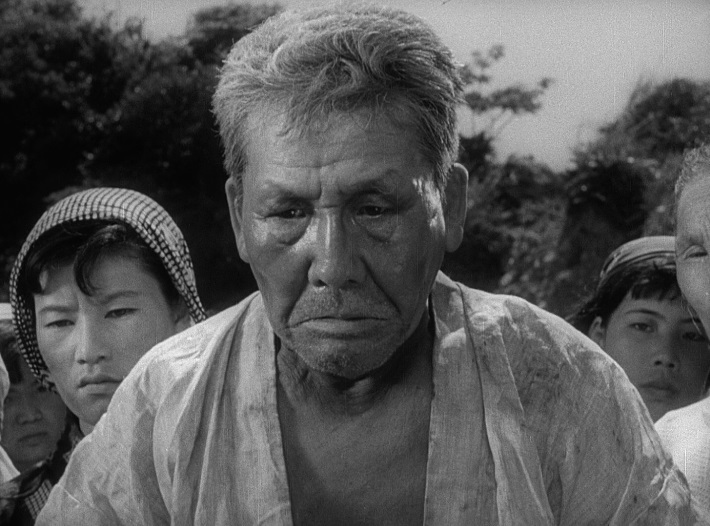 What is in essence a similar role to the part he played in Seven Samurai a few months previously, his part though is not that of the village elder but more an old-fashioned villager who remains to believe in the myths and legends of the area, including Godzilla. He is passionate about such things and can feel when something is not right, and even when he is shot down by the fisher girls about such a legend, he remains passionate about it shooting down nay sayers and almost passing off a threat by stating that the village may have to sacrifice one of them. This strong rage really stands out and it shows in his acting and presence, even more so when his character is centred in shot a brilliant scene. While later on he does calm down to discuss the village ceremony, his passion for the legend still holds out and is able to give a real insight into the ceremony. All of these characters though are minute, literally in comparison to the film’s title character. 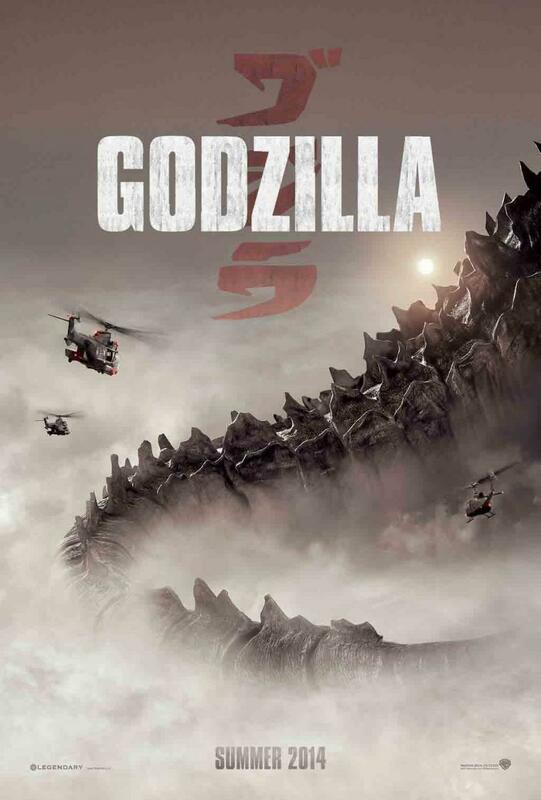 Godzilla at first glance appears to be just a giant dinosaur with the ability to breathe fire. He is a lot more than that though. He is the testament to the destruction and power of nuclear weaponry and technology. His initial start in this film is that of a sighting or a rumour as he is the cause of the destruction of the ships, but you don’t see him doing it. The only evidence to begin with of the existence of the creature in the film is the sound of his roar in the credits, but you don’t know what that is yet. As the story unfolds you get more of an identity of who he is from people mentioning the existence and legend of a monster. 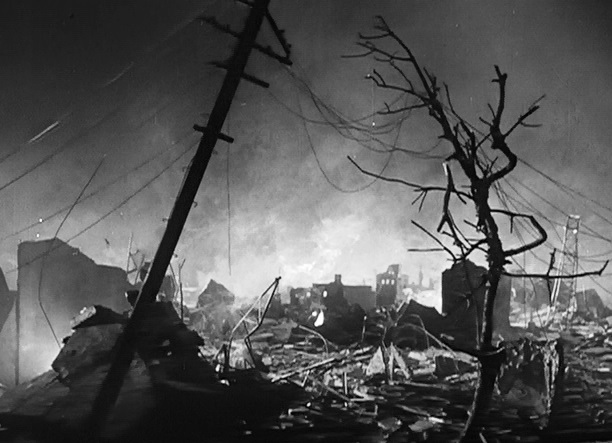 The first real sighting of the creature is not for about 10 minutes or so when he is just in shot destroying a house, but it’s still just a glimpse. By this moment you get a feeling of something big and nasty on its way, you just as yet don’t know what. His first proper full appearance on Odo Island finally attaches a physical being to the stories and evidence so far presented and now you know what Godzilla is you begin to wonder what he is capable of. Now that his identity is confirmed he becomes a more virtual part (rather than a rumour or a belief) of the film and begins to play out his part and what he stands for. For the rest of the film he is this approaching destruction, his power has already been proven, but now he is coming to do a whole lot more to a civilian population. Godzilla in essence and character is a representation of the destruction caused to Japan at the end of the second world war with the detonation of the nuclear bomb on both Hiroshima and Nagasaki, but instead of the giant mushroom cloud, he is nature’s answer. He is powered and mutated by nuclear power and presents the raw power of nature at its angriest. He is not just a creature; he is a sort of spirit as well as a metaphor for the nuclear age but in physical form. His walk through downtown Tokyo as well as the destruction he causes is the representation of the power of nuclear weapons along with his Atomic Deathray which is the unstoppable fire. His presence and look works both ways as his flesh has been burned and damaged from the testing of nuclear weapons, but also the sheer sight and power of such a creature, a creature that (as far as we know) does not exist, but can be seen here and now, right in front of you, and it terrifies you. He is the result of careless actions on the part of humanity and is a testament of mankind bringing such destruction upon themselves and as a result he has come to do to them what they have done to the world. He is at both heart and sight a Monster, but he is also a signature of a country whose recent history has gone through so much hardship and destruction and forcing them to go through that again. As for his actual look and appearance. The choice of black and white for the film’s format works perfectly. It presents the Monster as a shadow in the night and a terror that could be accidently not noticed if you are unlucky. His look as that of an upright dinosaur is brilliant and the spines down his back give the idea of a dragon and add more personality into the creature’s look. The Deathray is a great bonus to the character. The sheer presence and sight of the creature is enough to get the attention of the audience and give them something to remember just by its own merit, the addition of the Atomic Breath though gives the creature something more, something that gives his already majestic and terrifying appearance more power. His strength is also represented beautifully with modern weapons having absolutely no effect on him, at all. He can’t be stopped, something that becomes more abundantly clear in moments such as where he walks through the electric barrier fence, when the attacking planes and tanks have absolutely no effect on him and the moment where he bites into the Tokyo tower, all of them terrific scenes. The use of the name as a whole makes Godzilla automatically grander than other monsters as giving him a name, gives him personality and character. He is not a thing, he is not just a creature, there is something more and now you have a name to connect to him. His look, power and abilities are all his and next time you see him, you automatically know what he is capable of. The film’s special effects are terrific and when combined with what kind of effects can be produced today is still thoroughly enjoyable. While the production team, particularly Eiji Tsuburaya wanted to achieve the effects with stop-motion animation, they were unable to do so and so had to of course use a suit (worn by Haruo Nakajima). But the upside to this is that in comparison to stop motion animation, the effects have a more fluid and believable basis of movement and when used in comparison with miniatures give a real sense to the size and power of Godzilla as well as the level of detail on show. Even the little flicks and strokes of the tail and hands are a beauty to behold. It actually looks like a monster moving instead of a lot of jittery movement. The miniatures are wonderfully produced and brought to life with simple methods. Even in the close up shots of planes and tanks bring a degree of life into them. Other little touches of superb special effects include the death and disappearance of the fish in the tank and Godzilla at the end as well as the demonstration of the Oxygen Destroyer. 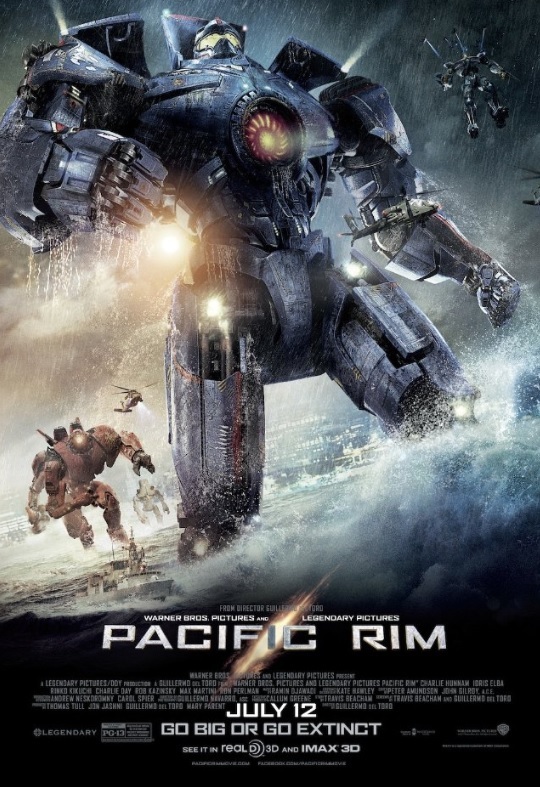 The underwater scenes at the end are terrifically shot and give a real presence to the viewer of actually being there. For the most part there is this genuine feeling that the staff at Toho were genuinely looking forward to destroying Tokyo. For a film produced 60 years ago this level of detail is still enjoyable to this day and shows real craftsmanship. The music and sound part of the film is a real highlight. The film makes a lot of use of music that is more on the dark and sorrow side and hardly if at all has pieces that are happier or upbeat. Scenes such as the science party on the island, after the destruction and at the very end not to mention the song delivered by the schoolgirls have a real impact to help deliver the films emotional points. In a similar vein, the underwater piece has a similar style but is more along the lines of discovery with the emotional coming in when Serizawa dies. The films darker pieces are used more for the part of sensing and seeing the destruction that is being caused. It’s mainly used in a later scene of Godzilla trashing down town Tokyo and an earlier scene where he crushes the railway. With the use of heavy beats that shock the audience to attention while still keeping the dark tone, the themes used in these scenes are not being used to show anything tasteful, more horrific and scary and dark and terrifying while also encasing an element of wonder and amazement, but not in a nice way at all, but in the heaviest, scariest way possible. The attack on Odo Island as well as Godzilla’s early moments of attack to his full on rampage through Tokyo still hold a dark impression on the scene through the music, but it’s quicker in tone giving more a sense of tension and drama than horror and gives the audience a break from the emotional side and allows a little bit of action here and there, plus the music works well with the storm. The ceremony scene and the ritual music in the ceremony is a nice little scene too. The main theme though is the best. It does not carry any emotion, or dark themes allowing it to be more upbeat. The piece is very classical and can be seen that way. 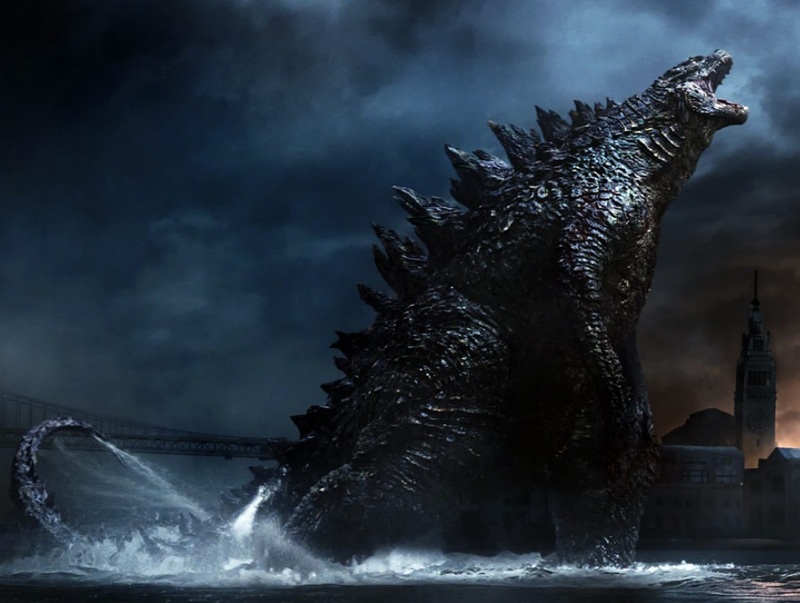 It is a far more traditional piece of music using traditional methods and instruments but in itself holds a level of action and gets the listener interested and the included use of the Monster Roars from Godzilla during the opening credits adds a level of mystery and questioning as you the viewer want to find out what is making that noise. Well, it doesn’t sound like an instrument does it? Sounds more like an animal. 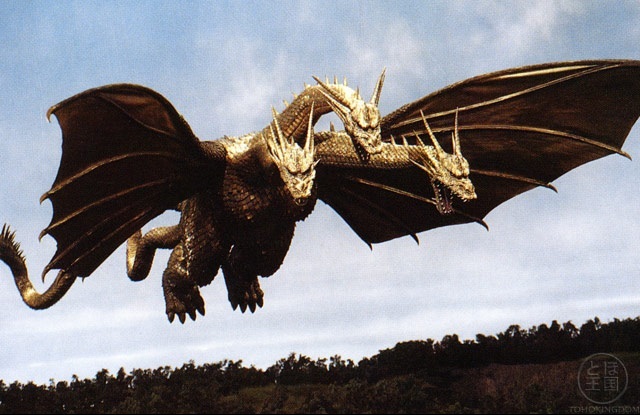 It works during the film too for when the jets come to attack Godzilla; it feels more like a relief, as if a rescue has come to save you from the disaster that has just unfolded and it is used again earlier on as well when the army gets ready to defend itself from the coming Monster. Overall it’s a piece that works well and has continued to work since (even if the level, sound and composure has changed variously over 60 years), now recognised in association with Godzilla himself as his main theme. Sound effects are not just kept for Music though. Godzilla himself needed a roar, and a roar was produced thanks to the film’s composer Akira Ifukube. The effect of the roar was made with the use of a double bass (contrabass) and the strings being pulled by wax-coated latex gloves and then slowed down. The distinctive roar was produced at a time when the production team experimented with animal noises but couldn’t get the sound right. This bizarre approach to producing such a sound though worked and has remained Godzilla’s roar since. The roar itself is a very powerful sound and gives an extra level of detail to the personality of the creature. This sound does not waver during the film and every sound Godzilla makes with his mouth has a connection with it, from growls and screams, to just announcing his presence and shouting at pitiful humans this in turn gives Godzilla his own distinctive voice and one that is enjoyable to listen to (even if it comes from a destructive creature who could crush the building currently separating you from him). Godzilla produces something for everyone. It has moments of drama, action, tension, love, tragedy and not to mention a whole lot of destruction. While the film at its basis is a film about a Giant monster, there is a lot in the human side of the film to produce a human side story to what is going on as well as little sub plots which have no involvement of the title monster. The Film is a story and a metaphor as to the results and consequences of nuclear destruction with moments where characters talk about their recent lives before the discovery of the monster as well as connotations with events from nine years previously. But while the film mentions those points, you need to remember what the film is really about, it’s about survival, survival from unknown threats only just discovered and the lengths people are willing to go to, to survive such things but don’t take the time to think about what will happen afterwards when greed and power takes over. This comes in the form of a Giant Monster, which is then killed by a weapon which was discovered accidently and then the scientist who kills himself knowing he couldn’t live with himself after using it. Alongside this it is also a very sad and emotional film. While the film begins with a question and leads to discovery, it ends with tragic consequences. While the end result of the menace being killed, it is achieved through a sad and tragic loss of a man sacrificing himself in order to get rid of the creature, but also himself. It’s not a happy note, it’s a very sorrowful note; and this is one of the film’s greatest power’s. Not just the power’s of Godzilla and nature, but also the power of Human Emotion. 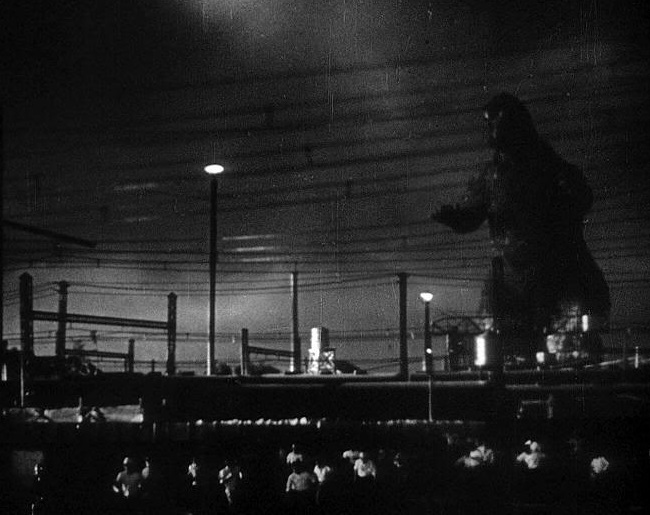 All together, Godzilla is an Absolutely, and Terrifyingly, Fantastic film which while may not be your cup of tea, is definitely worth watching. It is enjoyable from start to finish, minute for minute with great music, sound, special effects, characters, story and one big lizard, what’s not to like about that? 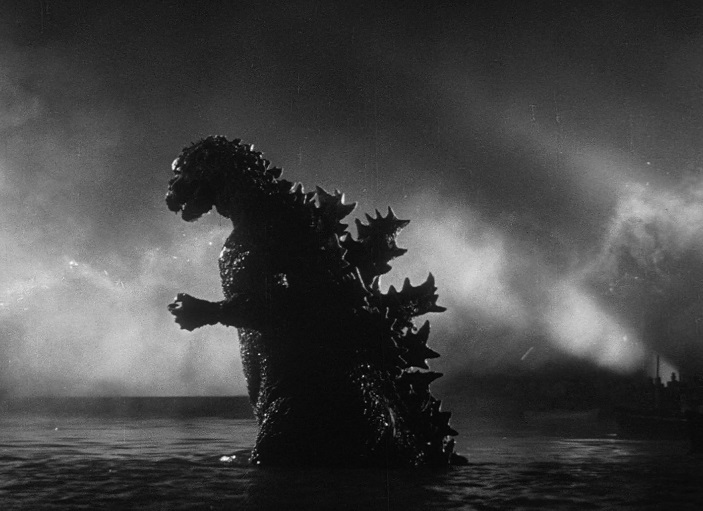 60 years on it is still one terrific film and more importantly it heralded in a new cinematic icon called GODZILLA. GENEPOOL (Unfortunately, while I was originally able to find an original trailer of Godzilla 1954, that has since been taken off YouTube; however, I feel that the above trailer that uses shots of the original film in a 2014 trailer style is a worthy replacement until an original 1954 trailer becomes available).